Learn LifeCasting with Accu-Cast's Kits- then buy our bulk alginate materials to do it yourself. LifeCasting is easy to learn, inexpensive and fun for everyone. If you've wanted to learn about this fascinating art form, our kits are the fastest way we know to get you going. We have a full range of kits from Baby Hand Casting to Full Torso Casting. 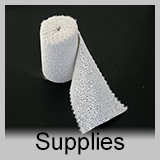 Replacement Alginates, LiquiStone and Plaster Bandages available. Kits contain everything you'll need- except water. Everything is pre-measured, and our exclusive "Mix-In-the-Bag" technique makes cleanup a snap. Once you've learned, we recommend that you purchase the alginates and other supplies in bulk- to save money. Accu-Cast offers a complete line of everything you'll need at affordable prices. 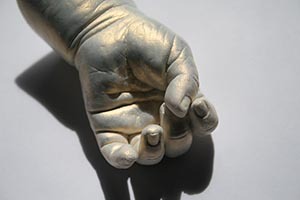 Artists are still pushing the boundaries of what can be done with alginate. We encourage you to have a vision and see if you can achieve it. We're always available to answer your technical questions to help out. Check our LifeCasting Gallery for inspiration. We make our own alginate, right here in Oregon. Some of our competitors purchase alginate from China to reduce their cost, but the quality and consistency can suffer. We oversee all the Quality Control in house to ensure your satisfaction. First, alginate is correctly pronounced AL-gin-it. 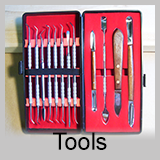 It was originally developed for making dental appliances, such as crowns and for braces. Alginate is sold as a powder. The end user- you- mixes it with water to form a thick liquid. The mixed alginate "sets" (changes from a liquid to a rubbery solid) in a matter of minutes. If the liquid alginate is applied to an object (hand/face/etc.) then the "set" alginate has made a very accurate "mold" of that object. In a hand casting situation, the alginate is mixed and placed into a container or bucket. The hand I submerged in the liquid alginate and left there until the alginate has set. The hand is wiggled and pulled out of the mold leaving an exact negative of the hand in the alginate. A casting material (there are many types, but a gypsum cement (similar to plaster) is the most common. When the casting material hardens, the alginate is removed. This most often requires breaking the alginate off in pieces- thus destroying the original mold. In most cases an alginate mold produces only one, unique casting. In a face casting situation (or head or torso), the alginate is applied to the skin in a layer about 1/4 inch thick with your hand. If you have chosen the right alginate formula there should be very little "drip". (Our alginate formulas- FaceGel and BodyGel- are formulated with an extra thickener so very little of it drips off the model onto the floor. This minimizes waste and makes them more economical than those of our competitors.) Since alginate is very rubbery and flexible when set, a hard shell of plaster bandages is applied to the outside of the alginate mold. Without it, the mold- once removed from the model's face- would flop around like a deflated balloon and be quite useless. When the plaster bandages harden, the entire thing is removed from the model and a casting material is poured into the mold to produce the finished sculpture. Alginate is not an "archival" mold. You cannot use the mold over and over. You cannot wait a day or more to pour the casting material. This is because the set alginate is similar, on a microscopic level, to a sponge. The water is not "bound" to the alginate and it will shrink over time. The water begins by evaporating off the surface- then that water is immediately replaced by water just under the surface. This continues until all the water has evaporated and the alginate is hard as a rock and about half its original size. This process is slow, but cumulative. Certain things can be done to slow this process, but it is inevitable and no one has discovered a way to eliminate it in the 80 years or so alginate has been made. We've been doing this a long time. We have worked with our customers over the years to develop a full range of formulas to meet the exact needs of different types of projects. We currently offer 9 different formulas- each with its own set of working and setting properties that are ideal for different projects. 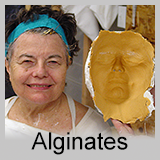 Do a little research on our site and get the alginate that is exactly right for your needs. Most of our competitors offer 1 or 2 formulas and expect you to "make it work". Here is a Listing of our Alginate Formulas.